July 20, 2010, 9:17 PM · GURNEE, Illinois - The 2010 edition of the Theme Park Insider Summer Roadtrip rolled into northern Chicago this week, for my first visit to Six Flags Great America in 20-some years. It might as well have been my first visit to the park, given all its changes since I last visited, as a Northwestern undergraduate. The iconic double-decker carousel remains at the front of the park, but beyond that you'll now find a strong collection of Six Flags' roller coasters. We started the day at the Dark Knight Coaster, a ride I typically would never consider, given its low average rating from Theme Park Insider readers. 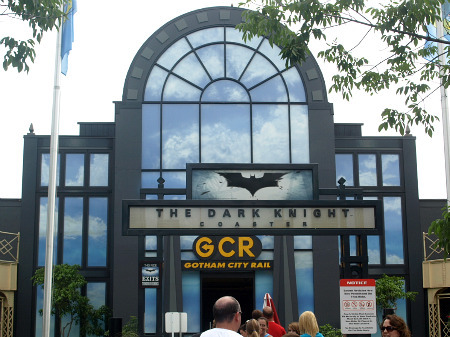 But since the Dark Knight, with its various dupes around the country, is currently the single lowest rated ride on the website, I figured that I needed to take a look, to see why readers seem to loathe this attraction so much. Let's consider that question answered. Give Six Flags credit for trying. Unlike its other coasters, where "theme" means simply the name slapped on the queue entrance, DKC attempts to engage visitors within the story of the hit film. But the pace of the Aaron Eckhart press conference video in the pre-ride show drags like six-year-old told to clean his room. I wondered if I could hit the remote and see what was on ESPN instead. The Joker interlude's fun, but why are we getting on a roller coaster now? Listen carefully as you exit the pre-ride show, and you can hear an audio spiel about "evacuating the city." And here's my biggest pet peeve with Six Flags' attempts at roller coaster storytelling: Whether it's the Dark Knight Coaster, Batman or Terminator: Salvation, we're always "evacuating." To heck with that! I want to stand and fight. Just like I get to on Spider-Man or Dragon Challenge. No, on Six Flags' coasters, we run away, scared. We're told to begin the ride in resignation and defeat instead of with the adrenaline rush of impending battle. Bleeh. The Dark Knight Coaster compounds that failure with the "wild mouse" back-and-forth track (Disney fans will be reminded of Mulholland Madness) that's contained in a warehouse-like room not dark enough to conceal the track design. The track design wouldn't be fatal, but add on a few non-sensical visual effects, culminating in a weird colored light that I first thought might be an oncoming train gag but turned out to be - I don't know what. And then we exited, right back where we boarded. Huh? What about the evacuation? How much more frustrating it feels to experience something that tries, and fails, to tell a compelling story than a ride that never attempts a story at all. That's why I think riders punish the Dark Ride Coaster so severely. Unfortunately, you don't always get credit for trying. In fact, failure often brings extra penalty instead. Yet as Theme Park Insider readers take away, they also give. TPI readers have voted Great America's Raging Bull among the top coasters in the nation. Working my way though its queue, though, I began to question your judgment. (Sorry!) The setting for this Bolliger & Mabillard mega coaster ain't nothing worth noting: no water element, as on Kings Island's Diamondback, or spectacular river views, as on Apollo's Chariot at Busch Gardens Williamsburg. Just track twisting around a scrubby plot of weeds, grass and dirt. What's the appeal? Just get on and ride - you'll soon find out. Never have I ridden a coaster that blends smoothness with airtime so brilliantly. Often, great airtime comes from vertically whipping riders up and over hills. Raging Bull earns its airtime from perfect timing of turns and drops as well, leaving me feeling as if I were floating above my seat for many seconds at a time. Until we hit a series of s-curves at the end of the ride, where we scrubbed off our speed before the final brake, I felt as if I spent more time out of my seat than in it. Natalie and I agreed that Raging Bull won our honors as the best ride of the day. Great America reflects much of the improvement within the Six Flags chain over the past years: All rides were open and the big coasters were running multiple trains. Employees are keeping the park immaculate. Workers greeted us with enthusiasm throughout the day, taking initiative to ask if we needed help finding our way. Use foul language or light up a ciggie in the wrong place, and they'll toss you out of the park without hesitation. Or a refund. Unfortunately, frustrations remain. Six Flags nickels-and-dimes you like no other theme park chain. Parking cost $15, a dollar more than at Disneyland or Walt Disney World. And that puts you in the remote parking lot, leaving you to hike across the sea of asphalt reserved for those who paid even more for the premium parking fee. (And seasonal passholders who bought the extra parking pass.) What about a tram to the front gate, you ask? Hah! 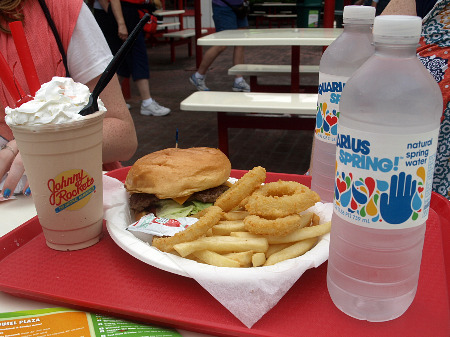 Here's what $25 gets you at lunch: A cheeseburger with rings and fries, a chocolate shake and two bottles of water. Tasty, but ouch. Want a Papa John's pizza, advertised all over the park? You can't buy a slice, or even an individual pie. No, you have to buy a $10 combo meal, which includes either a side salad or couple of extra cheesesticks, along with the individual-sized pizza. (The drink remains extra, of course.) It's just another one of the ways that Six Flags earns back its various admission discounts. I'm not a cheapskate when it comes to theme parks. Far from it. I'll drop $100-plus on a meal, if a park delivers value worthy of that amount. But to eat fast-food-chain food on metal outdoor tables while commercials blare over loudspeakers? Better cut the price way down for that. Six Flags jacks it up, though. So skip the food. I love my local Six Flags park, Magic Mountain, but I never spend an entire day there. And that's how to get the best value from a Six Flags park. If you live in the same city as a Six Flags park, buy a pass early in the season when the best deals are available. (Get the parking add-on, too.) Then drop in and enjoy some great coasters and other rides whenever you want, throughout the summer. Don't bother eating in the park, save for the occasional splurge on a funnel cake sundae or some other treat you can find only in the park. Leave your stuff in the car and avoid the locker charge. Don't get nickel-and-dimed. While the chain's improved greatly over the years, due to the nickel-and-diming and general lack of unique and original narrative attractions, Six Flags still aren't destination parks, like Disney and Universal. (Unless you're a coaster fanatic who has to bag every version of every model, no matter where. You know who you are.) But having Great America nearby provides a great perk for any roller coaster or theme park fan living in the Chicago area. Don't be afraid of an out-of-date reputation. Come out and ride. July 20, 2010 at 11:05 PM · Fantastic report on the "home park" of mine. It looks like you hit the nail right on the head with the Dark Knight and food. I will give the Dark Knight a bit of leeway due to some of my family and friends not being big coasters fan. Raging Bull is desert themed (like SW Territory) so I do not know about scenery. Also, the views of the highway and the rest of the park are supposed to be the scenery (yeah, I know, whoop de doo). The only item I kinda disagree with you on is the overcharging that they do. Don''t get me wrong, they do it massively and, especially for what you get, badly. However, I do not think its as grim as you put it out to be. Remember, it was less than $40 to get into the park. Thats less than half what you pay at the FL parks. They need to make up for the money another way. You spend about as much as you would at a Disney park too. The question is......is it worth it? As a season pass holder with parking, I spent $130. So, pretty much, I save if I go at least twice a year and once for fright fest. July 21, 2010 at 6:55 AM · It is good to hear from you, Robert! Thanks for the first of several reports. 2) What ride did your kids like best? 3) Where did you stay during your visit, and did you just stay one day? 4) Your thoughts on the Glow in the Park parade? 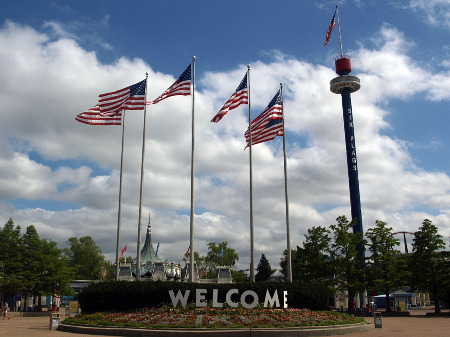 5) Is SFGA a vacation destination for a family of five looking for something a step or two above Six Flags Saint Louis, or is the place a one (day) and done amusement park? July 21, 2010 at 8:02 AM · I can't compare crowds to other days at this park, since this was my only time here in ages. But I found the crowd to be a typical summer weekday crowd when compared with other parks, with mid-day wait times ranging from 20-60 minutes. Natalie liked Raging Bull best. Brian liked the extra-fee Sky Trail, which doesn't appear on the park map, BTW. Laurie went along with Brian, and was terrified, but Brian took to this sort-of vertical obstacle course like a monkey to a tree. We stayed at the Hampton Inn across the street, which was a pleasant, but well-worn hotel with the worst mattress we've encountered all trip. We bailed before the parade, but the kids also enjoyed the Big Easy Balloons and the Rue le Dodge (bumper cars). Natalie and I also rode Viper, Batman and Superman, which we enjoyed but though SeaWorld's Manta provided better visuals. I don't remember Manta's headrest forcing my head down, keeping me from looking forward, the way that Superman's did. I'll have more to say after visiting Cedar Point, but if I had to pick a midwest park as a destination visit, I'd lean toward Holiday World at this point. I'll get more into that with a post next week. July 21, 2010 at 8:41 AM · If I could answer your question James, I think a day or two is the only thing you can get out of Great America. However, it would be worth the trip if taking a little vacation to Chicago. The other great find in Gurnee is the Gurnee Mills Mall which is a ridicoulsy huge mall. It has a ton of stores, resturants, and an ice rink. Still, the span between downtown Chicago and SFGA is about 1.5 hours tops. There is a Botanical Gardens, Lamb's Farm, Ravinia, and many other great finds on the Edens Expressway! And yes, Robert, Superman has very uninspiring visuals to go around. They were a little quick to put that one up! Did you check out the Whizzer? Its an oldie, but one of my favorites at the park. Also, did your hotel have any special deals on tickets or transportation? One of these days, I am going to try and go up during a weekend and stay at Key Lime Cove which has a partnership with SFGA on tickets and free transportaton to and from the park. Oh, and I was curious about Holiday World. 6 hours away? Too far for one park for me! July 21, 2010 at 9:08 AM · Glad to see you enjoyed SFGam (I liked it too), When you go to cedar point (I assume you are staying on property), use your early entrance to ride maverick and millennium force, after that check the line for TTD, if it is over 30-40 minutes, wait until later, the line will die down. When I went to CP, we came back to the park after dinner that night(to avoid another meal in the park) to do night rides on many rides, you will find that the park is dead near closing, in the heat of the day do disaster transport as the queue is air conditioned. July 21, 2010 at 9:17 AM · Great report, Robert. I enjoyed your comment about Six Flags' tendency to evacuate people. I never picked up on that. I'm interested to see your perspective on Cedar Point. 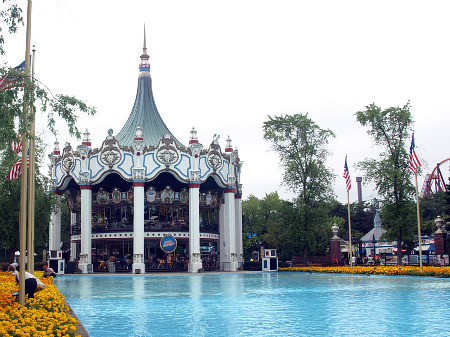 It frequently is awarded the best theme and/or amusement park in the country/world by critics and fans alike. True, it had an amazing array of coasters, but even after spending two days there I somehow felt that something was missing. I didn't leave the park with the satisfaction that I normally experience after a great park. Normally, I would blame the less-than-optimal experience on the poor food, lack of theming, and other factors typical of amusement parks, but even my "local" amusement park, Canada's Wonderland, leaves me grinning and satisfied at the end of the day. I think it may have to do with a general dreariness associated with Lake Erie. July 21, 2010 at 5:53 PM · One of these days we'll make it to this park. I've been wanting to ride Raging Bull for years, and my annual pass to SFA with parking would get us in for free, if we're ever in the Chicago area. Here here on the food at Six Flags. I would say, though that there are some deals to be found in some of the Six Flags parks. SFGAdv and SFA both have a few restaurants that offer single entrees below $10 that are big enough for two to share, and I do recall the all-you-can-eat buffet at SFMM a decent deal (if it's still there--we haven't been since 2008). However, I have definitely noticed the food prices in SF parks slowly creeping up the ridiculous scale. They're really to the point where it does start making sense for you to leave, drive across the street, and eat lunch somewhere else. To me, the parking should just be part of the admission, because it's not like guests are really paying for anything at Six Flags. A few of the SF parks run trams (SFNE, SFA on busy days, SFDK, and SFMM), but all guests are paying for at most of their parks is a long walk to the front gate. Guests would probably feel like they were getting a better deal if parking was free and the daily admission was $15 more per person (the park would make more money that way too since the parking is per car, not per person). July 21, 2010 at 8:02 PM · THey are nothing but money hungry people. It als ocomes with the Nmae jonneyrockets is somtimes a bit pricey themselves. July 21, 2010 at 11:06 PM · Great review, Robert. And it may be too late, but here's a tip for the best Magnum ride -- seats 5-1 or 6-1, & try to avoid being stapled into your seat. July 22, 2010 at 7:27 AM · For some reason, SFGA just has never had great food and I am not exactly sure why! They do make up for it in the sweets department offering popcorn/Cotton Candy Tubs that are refilable, pop cups with free refills for the day, funnel cake, fudge, dippin dots, cookies, coffee, and roasted nuts. So yes, they do very well on junk food! July 22, 2010 at 10:57 AM · Anthony -- I saw you mentioned 6 hours being too far for you to consider checking out Holiday World. I think you should reconsider. My friends & I have about a seven hour drive to the park & it's worth every minute of that drive. The park is absolutely amazing with friendly staff, great food at a good value, amazing coasters, family rides, and it's well-maintained. 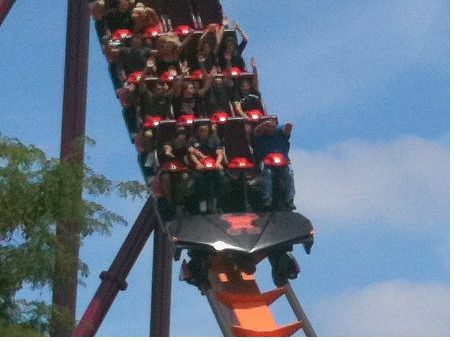 July 22, 2010 at 1:49 PM · I've said this before but, I'm not a fan of Six Flags. 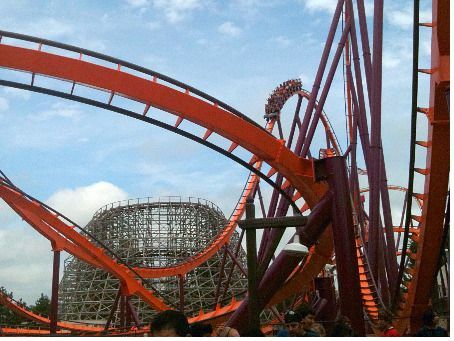 I have been to several of their parks and the only one I really like is Great Adventure in New Jersey. I'm not surprised at all of the way u felt "nickel and dime" about everything. July 22, 2010 at 6:24 PM · I agree with Erin. Holiday World is most definitely worth a six hour drive... Just watch out for that wacky time zone change if you're coming from the east or north. The coasters are simply phenomenal (two of my top five and three of my top ten). July 22, 2010 at 8:20 PM · 6 hours is nothing. My closest parks are 4 hours away and they're certainly not Holiday World quality. July 23, 2010 at 11:00 AM · You can save some $$ in the food line by exiting and crossing the street to the entrance (walk or drive). There's several fast food restaurants right there. Most locals do that, or tailgate from their cooler in the parking lot. Then head back to the water park for stretch. Then a few more coasters in the evening.